The EFF leader has slammed Cassper for legal action against Benny Mayengani over the #FillUp trademark. 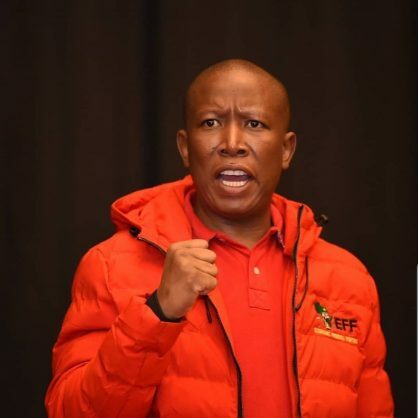 Julius Malema has fired shots at Cassper Nyovest on Twitter after the rapper filed a legal action against musician Benny Mayengani for using the hashtag #FillUp to promote his gig on social media. The rapper started trending on Twitter yesterday after he issued the Tsonga star ‘cease and desist’ order for trademark infringement after Mayengani used the #FillUp hashtag to promote his Giyani Stadium concert. Cassper’s management told the Sowetan earlier this week that the rapper trademarked the hashtag and Mayengani did not get his permission before using it. Malema then waded into the dispute on Twitter, calling Cassper a bully and pledging his support for Mayengani. “We will defend you chief @BennyMayengani, don’t be scared of bullies who are threatened by talent. We have the best in town, let them bring it on. #FillUpGiyaniStadium,” the EFF leader wrote. The EFF then issued a statement in which the party condemned Cassper for his actions, calling his behaviour a “selfish, desperate and lousy attempt to profit alone on what is anyway everyone’s, everyday language”. “We note this as a greedy move by an artist who should be celebrating that he has inspired others to brave up and fill our stadiums, instead of this only being preserved for international artists,” the statement reads. The social media salvos that Malema and the EFF have fired on Twitter have divided tweeps on the platform. Some are staunchly on the side of Cassper, while others agree with Malema that the rapper is punching down. It’s been a rather bad 24-hours for Cassper Nyovest. Along with being called out over his legal action, the rapper found himself in Twitter’s crosshairs when he announced that a childhood friend of his had committed suicide.